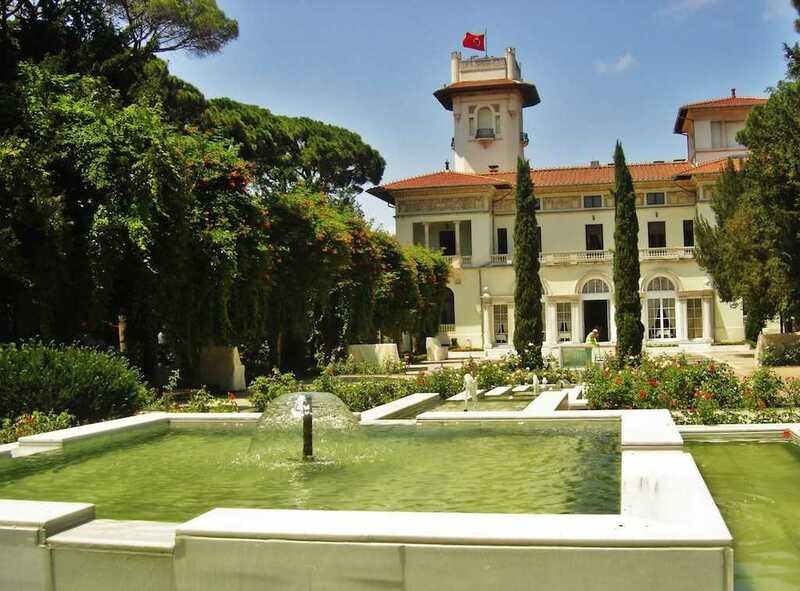 Established by an Italian Architect Delfo Seminati, the Hidiv (Khedive) Kasri was located on the hill of coppice forest of Cubuklu, Istanbul in 1907. 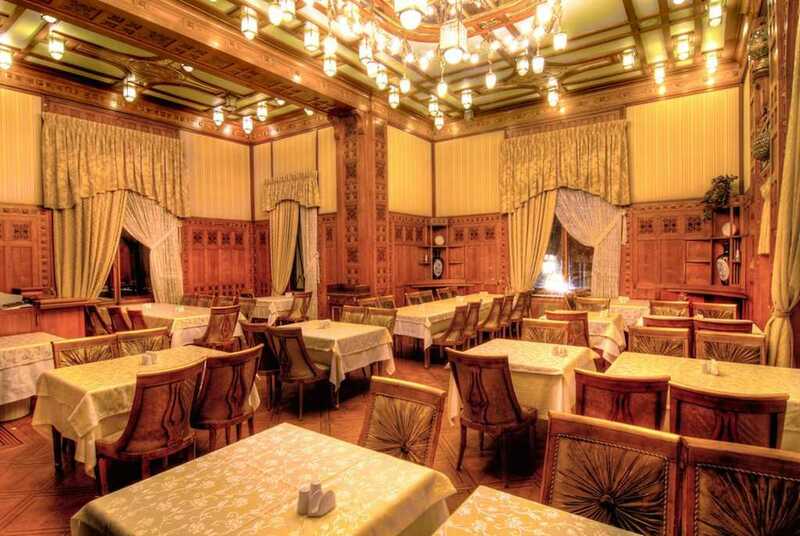 It comprehends a sum field of 1000 square meters and reflects the style of “art-nouveau”. Once Egypt acquired its independence from the Ottoman Empire, the last Ottoman governor of Egypt, Abbas Hilmi Pasha was dismissed from his authority as khedive by the order of Ottoman Sultan Mehmet Resat V. Therefore, Abbas Hilmi Pasha began to live in the Hidiv Kasri with his family in Istanbul. 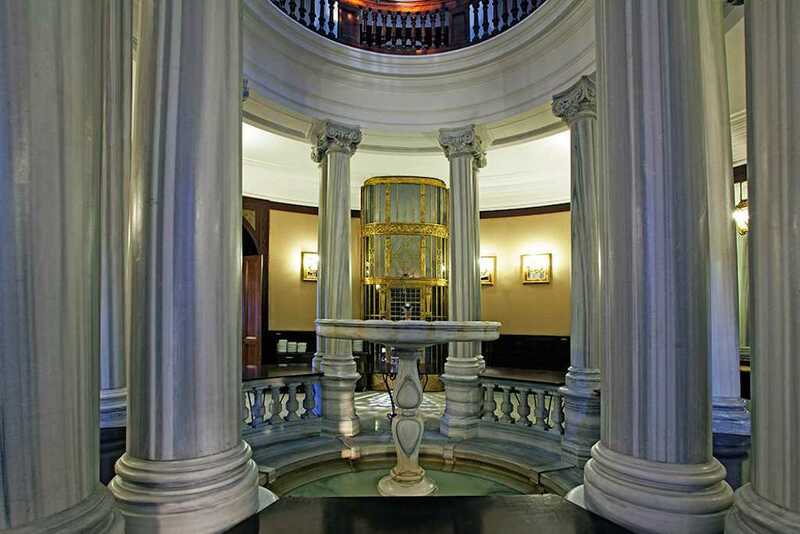 In the center of the basic entry of the Khedive Pavilion, marble fountain is located here. 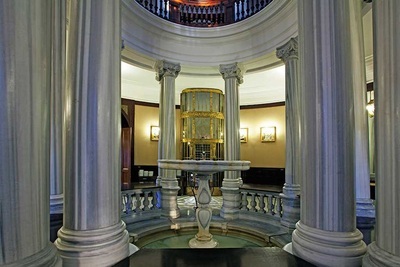 The hall of pavilion contains a circle around the pool and that circle is placed in the midway of entrance hall. Also covered perfect stained glass, the ceiling of Kasır attracts the people. Situated on the entrance of floor, bathrooms, toilets and walls surrogated the two extensive bedrooms. The grate and the circle chains (circle-line) part of that hall fascinates the visitors. Additionally, they can see the landscape of Bosphorus from wachtower of pavilion. Furthermore that tower is most famous part of that magnificent mansion due to its landscape accross the Bosphorus. If you look from here, you should use both by stairs and by an elevator in order to arrive at the terrace. 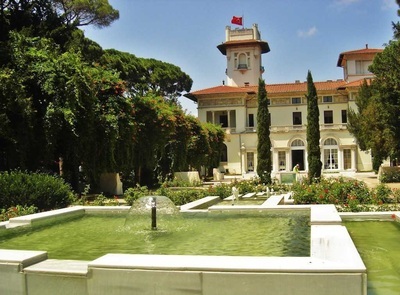 Because in 1930s, Abbas Hilmi Pasha abandoned Istanbul, Khedive Pavilion was given to Istanbul Metropolian Municipality. Although between 1937 and 1982 years, it was seldom used, it was damaged due to being used as a movie set time to time; the movie makers were not careful enough, they broke the stained glass windows to create more light for their movies. 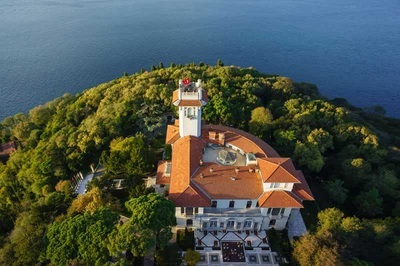 Therefore in 1982 TURING (the Touring and Automobile Association of Turkey) tried to begin the renovation process upon that mansion. 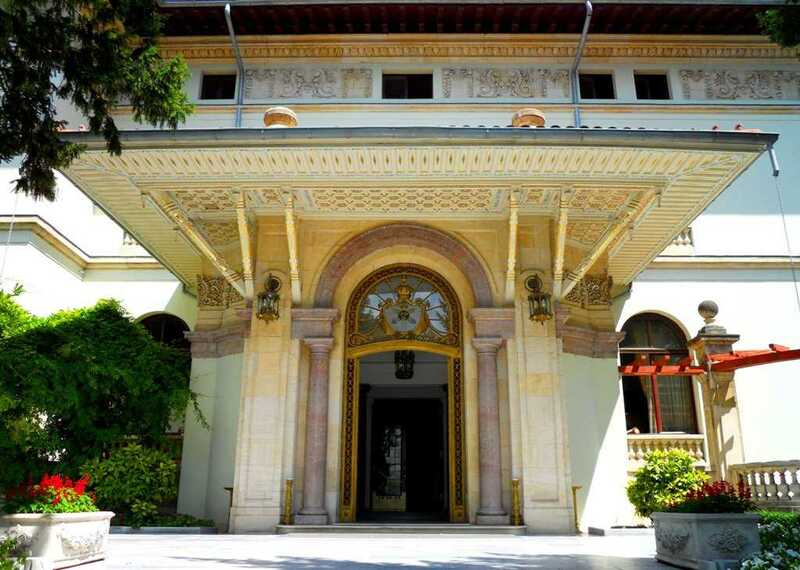 After several years Khedive Pavilion was reopened to the visiting as restaurant, hotel and cafe. Except for those features, the mansion is seperated many other parts of hall. As soon as the visitors step in that hall, they face to face a huge magnificent fountain covered marble and mosaics from floor to ceiling. Surrogated by iron framed windows that hall opens its doors to the enormous courtyard. Specially polished the marble columns and the ceiling of the hall include mix of pink, white and green chandeliers which were firstly used in Turkey. When they are lightened, that courtyard looks like a fairy palace with color harmony. With the mixture of green-gray marble casting, the tables and the chairs occur a kind of privileged palace aura. When it is gone from courtyard with pool to accross, the people face to face double fireplace hall which is concave-shaped. 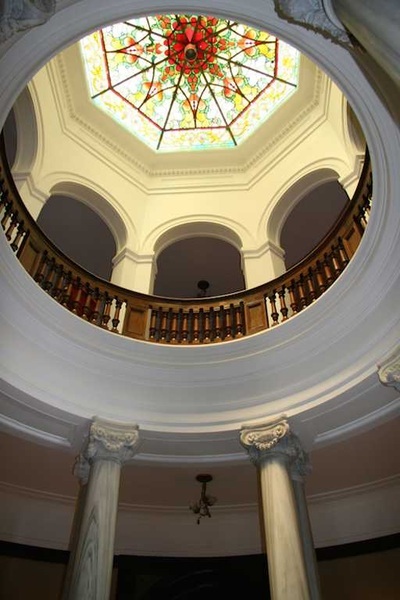 That inspiring concave hall opens its gigantic two sided doors to the marble terrace. Additionally, all slab of the hall made of the mahogany wooden. Its furnitures reflecting the old times success to stand in our today and the ceiling of the concave hall includes the candelabras lightened by crystal lights. Actually,it is a dining room named ''crystal hall'' because it was ornamented with crystals. Furnished with the flowers motifs ,gold leaf, mirrors and brass lantern, the crystal hall is not only one of the most eligible part of the Khediev Pavilion but also fascinates the visitors. Covered with the mahogany wooden, the hall displays us most impressive samples of the wood craft with its wooden furnitures. It is the center entrance of all rooms and halls. So, the feature of that hall; there is a special elevator to wander around all parts of the magnificent pavilion. Located on the marble hall, the first storey of the Khedive Palace composes of six rooms. While the main three rooms provide the people to see the rose garden of that palace looking a section of the paradise gardens. When you open the windows of those rooms, you should inhale those refreshing roses' smell by closing your eyes, which feels as if you are located in Eden Garden. The other three rooms are situated on a main hall. Within that floor, there is two bedrooms in the concave hall. That two bedroom specially contain toilet and bath. Once upon a time khedive Abbas Hilmi Paşha stayed one of those two bedrooms reflecting unique motives of wood craft .Additionally,there was secret gateway used as a enormous wardrobe with mirror belonging to Pasha in that room. He could arrive at the center hall by using that wardrobe if there was any emergency case.